WHY DO MOST OF THE TRADERS AND TRADES FAIL? – The two pivotal questions of traders address by Sam Jacobs of Alertel Buy Sell Trading support Software for FOREX and Indian markets. WHY DO MOST OF THE TRADERS AND TRADES FAIL? The two pivotal questions of traders address by Sam Jacobs of Alertel Buy Sell Trading support Software for FOREX and Indian markets. We are in the world market for five plus years and have numerous clienteles across the world who talks to us on a daily basis. Enabled with years of experience with able staff around the world to support your needs plus a robust research and development team makes a mark in your trading world. by communicating to thousands of clients and based on their thoughts we summarize the mental state of almost all traders across all the money markets in this world to two basic questions. 1. Most of us have asked this question, if money markets can make millionaires why do most of the trades end up in loss? 2. Life is short we all have big dreams and time is not enough and then adding to the misery most trades fail. Why? Find the answer to these two questions and you are on your way to become a millionaire. I’ll try to explain what I derived out of those two questions. I am a stock market veteran of 17 years and I have seen the ups and downs and do’s and don’ts of this trade. I would like to share my experience with you. Like many people I also started with stock market with a prejudice. I thought no matter what I do would land up with money in my pocket. Little did I know that this was a vast ocean and you can never stop admiring or cursing it. Admit it most of our trades happens like this. We see the chart for a long time. We come to a conclusion that this is the entry point and we enter. Just we enter and think that everything is fine the market starts to move against us, right? Hey Sam, why do most of the traders fail or most of the trades becomes negative the moment you take a buy or sell when everything looks fine? “I don’t know to be honest with you”, I said without even thinking why. That night I could not sleep as usual. Something was nagging in my mind. After years of financial markets know how I could not even answer the young trader’s question. He was genuinely worried about his trading style and maybe he thought that he could get some real good answers from the so called news analyst who was supposed to know the secrets of the market. I couldn’t sleep the rest of the night. I went and made some coffee and sat on the balcony looking at the starlit sky and the empty streets. I asked the same question to me “Why do we fail”? Hey If knew the answer life would’ve been a cakewalk right? I would’ve been on the cover of the Forbes. Come on dude you don’t know. I kept saying this to myself. Another voice in my head “If you do not know, search for it, you will find it. Sounds familiar right? Yes the Holy Bible, Jesus’ words. So I started my quest to find the answer. After a month into research I found that there are two types of players in the financial markets. 1. The Big players who decide what has to happen – Yes, you read it right, do you really think a stock or a currency pair comes to the market to the hands of the retail players without a secret agenda? Then you know nothing. Yes its fate is decided and the Lion’s share of the money the stock that has rolled out has been already decided where to go and how much. You could place almost all the corporate and underwriters in this category. They know how the retailer players with the stock and so on….so if any one tells that it is the hands of the public most of the time it is just ignorance speaking. 2. The common man or the retailers – us – Yes we get what is left over from the big players table. It is the fact. We trade those stocks not knowing the history or the implications or what is the fate of the stock. All the while we been told by the so called market analysts and the media and it is just hype. This knowledge comes from years of experience and you should seek for it. Then eventually you may come to know how the market works. Yes but we still can make the most of it, but the big question is how? · Because thinks he is right about the stock. · He thinks his entry point is the best one. · He believes he knows the market. · He has his emotions trade instead of logic. · He is so closely attached to his port folio that he thinks that is an extension of his true self. · He thinks his market will not betray him. To simplify the above he just gambles. Where do we go wrong most of the time? Look at the below two charts and tell me what do I do next, buy or sell? Now the big question to you look at the above two charts and tell me what should I do the next buy or sell? I have asked the so called market experts these questions and none of them could not tell me whether I should buy or sell. Now just think that I am an ordinary trader who wants to make a living out of money markets? Where should I enter? What should I do? Trust me. The key to a perfect trade is the entry point as well as the exit point. If you miss the entry point there is no use of trading immediately rather you should wait for the next entry point, but when and where? Then what are they, before I tell you what are they you should admit that many of us when we see three or four consecutive green candles we assume the market is going down and when we see three or more consecutive red candles we assume sell. Here in this letter you will not find complex algorithms or geeky market insights. I just try to tell you where exactly we read the market wrong. 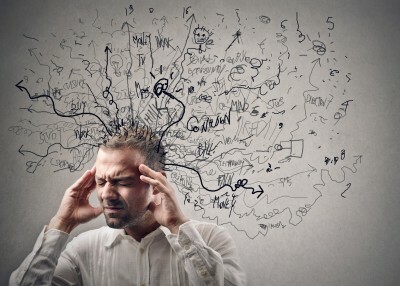 The below picture explains the real things that happens in a traders mind. Yes we gamble we think all reds are selling and all greens are buying. But no one understands that most of the green or so called buys are generated in the actual sell area and most of the Sells or the reds are generated in the buying area. What does this mean? Remember- It is just the movement, not the actual entry point for buy or sell. So where is the BUY and SELL areas and how do we find it? Confused? – Look at the above two charts and tell me. If you remember I have told you that not all greens are buying and reds are selling. Apply this thought always. On a normal day the buy and sell areas will be visible to you very few times miss those and you will be entering the market at the wrong area and time. This is the only reason most of the trades fail. 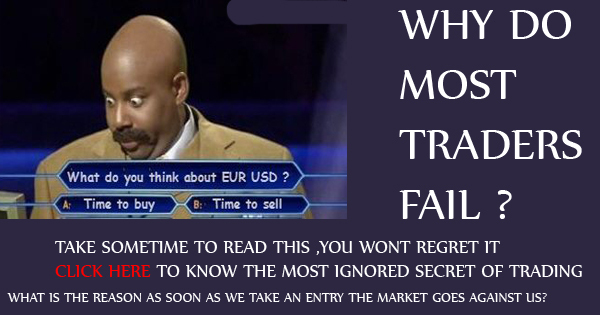 Before we get into that let me ask all the traders out there and want to be traders out there a simple question. Why you do not have patience when it comes to stock market trading? You must have heard “good things will come to those who wait” It is true. You can wait patiently for anything anywhere in your life but when it comes to trading you want it big and you want it quick. Well market does not care about you. It is an emotionless monster waiting to devour you. You mess with it and it will mess with you big time. Understand this logic and you are the right path. There are no robots in this world that can make you money or that can do the thinking or hard work you can put in your trading so say a big NO to any kind of robotic trading. It will destroy you. Again pledge a No to robotic trading and those people who say come to us take our free tips on face book and wahtzaap groups or sms or through mail. Those are their thoughts and trust me even by any chance they are good to by the time it reaches you the perfect entry point is gone forever. You do not want to try your hard earned money on some random person’s expertise. This too will not work. By the time you realize that there will be a great hole in your pocket. Stock market is Goliath and we are David. It has huge and ultra modern weapons and what do we got, almost nothing. Most of us have heard and seen fortunes being made in stock markets and we always wanted to try our luck in there but were too scared to enter and try out. Good things will only happen to those who take risks. And trust me it is easy to say. So how do we find the buying area and the selling area? Good question, let’s begin – it took me six years of research and I can proudly say that I am applying the results of my research in my own trading and is seeing positive results. Over this period I learnt the value of being patient and being persistent. Stay hungry but never get into bad trades. 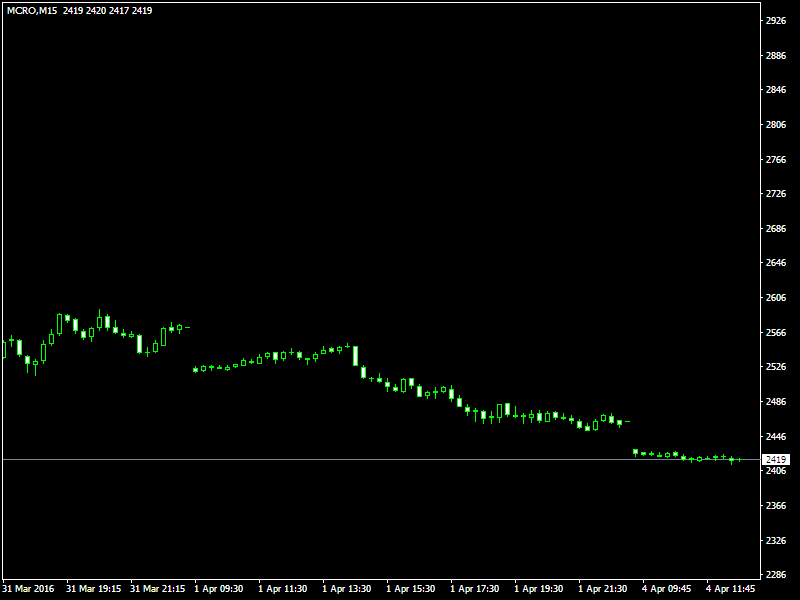 You need to wait for the perfect opportunity for that perfect buy sell entry. It is not easy for after some time looking into the charts your emotions takes over your logics. But you need to master art of being patient and there is no other go. Open those favorite charts of yours, not too many max five because human mind has got limitations you cannot concentrate more than couple of things at a time and not more than an hour for that matter. 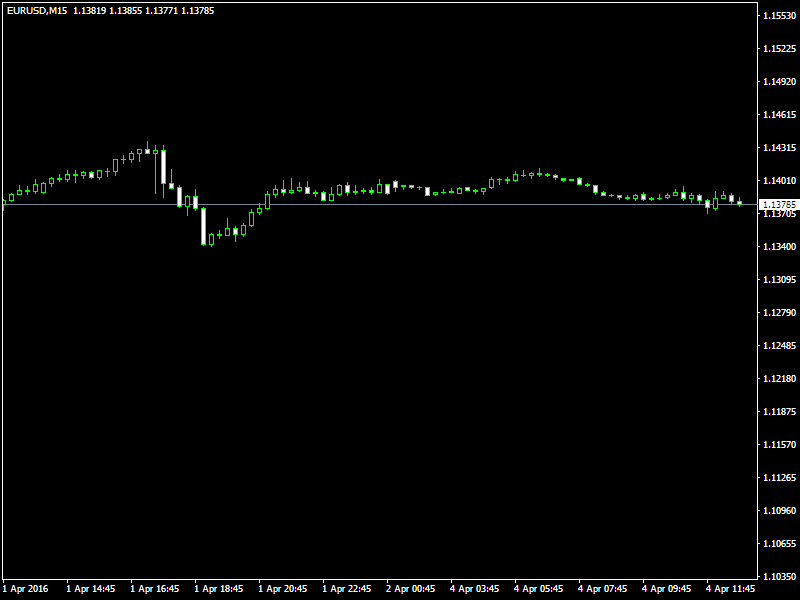 You need to find a reliable system just to find out those areas and not to trade automatically. You should avail the help of the system but trade only using your brains and fingers. Imagine your favorite stock or currency pair as a person, a human being or think it is you. You can divide yourself into three portions the upper body, the midsection and the lower body. This is the same as your stock or your favorite currency pair. It has three sections. 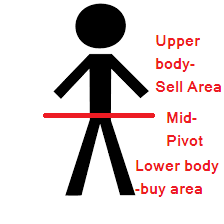 Just like the picture above the part above the waistline is the Sell area and the part below the waistline is the Buy area and the waistline is the pivot line which differentiates both areas. Just like you will not wear your trousers on your upper body and your shirt on your lower body you will not buy in the sell area and sell in the buy area of your stock or currency pair. Are you getting the concept now? All right we got it, tell us where do we draw the waistline on our stock or on our currency pair? You really need a market system for that, why I say is because we are not market experts. In my case the system we developed marks two candles strategy above and below the waistline or the pivot line. Let us take the example of the same two charts above and you will see and feel the difference. 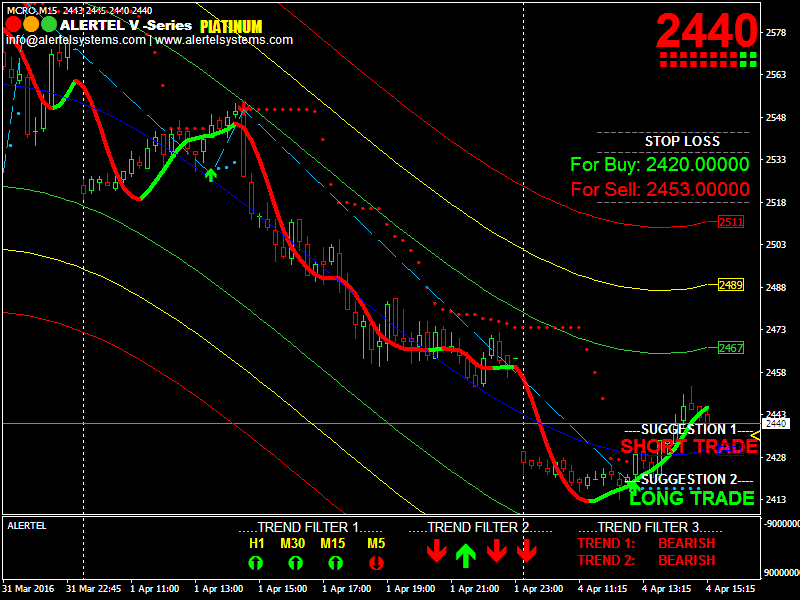 Chart with Alertel Platinum V series buy Sell Signals Software running. Now I can easily identify the waist line – the blue line in the middle acts as the pivot in this system. The area above the blue line in the middle is the selling area and the area below the blue line is the buying area. Is it really hard to identify that? Now most people do not have this idea and that is why they take the wrong trades in the opposite areas. They take a buy in the sell area and the sell in the buying area and now you tell me now why most traders fail? I use the Alertel V series platinum trade support system in my trades. (Similarly you can use any trade support system according to your choice but be careful with the selection process; you do not want to end up with some software which is created by amateurs)Once the signal candle and the next candle forms and closes above the blue line i.e. in the Sell area and also the confirmation filters confirms it I take a sell and once the signal candle and the next candle forms and closes below the blue pivot line along with the filters I confirm it as a buy. Without a system and in my case this system the charts are as confusing as the first two charts. Choosing a good trading system is equally important – After trying so many I found a good support system in Alertel V series Platinum buy sell signal software for many reasons. 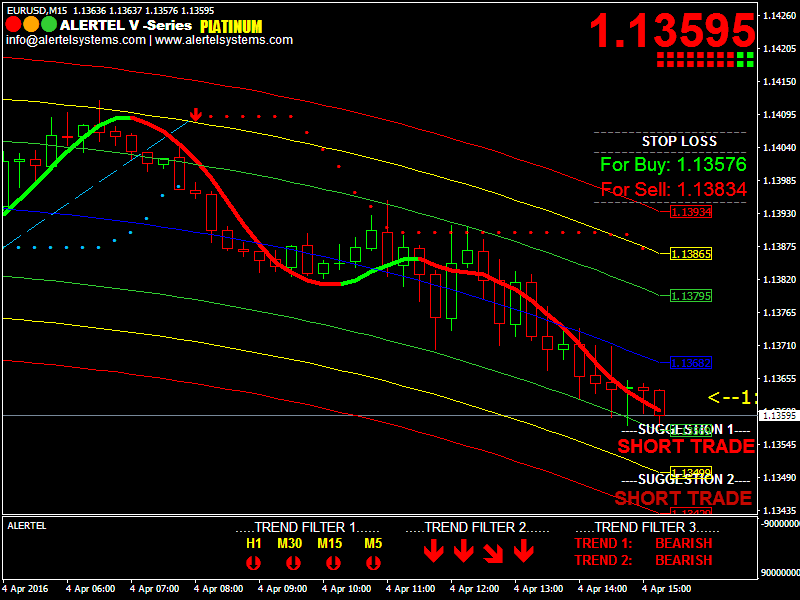 Dynamic buy sell signals with trailing stop losses. Displays the BUY SELL areas accurately. Displays three levels of EXIT. POINT TO PONDER – I use no robots. This is a not a robot I am using, the trades are done by me. Once you enter somewhere and you do not find and exit that is when you say yourself that you are trapped. While trading I have seen people make the right entry and destroy what they have made along with their capital due to failure in finding the right exit. I still do not really understand the mentality of traders who wait on the losses and same time come out as fast as possible on a profitable trade with bare minimum profit. I am Sam Jacobs and I consider myself as one of the early victims of the financial markets and I am still trying to set it right. I prepared this short essay after seeing the highs and lows of this market and I feel good if someone benefits from my words. Next article What makes Alertel V series automatic buy sell signal software the best in the market?